If your Reputation is lower than 3 you will be attacked by groups of three Flaming Fist Enforcers, a Flaming Fist Scout and a Flaming Fist Battle Wizard. Enter the Low Lantern AR0133. Go downstairs AR0134. You will be approached by Desreta. Accept her offer of entropy. She will attack. Kill her and her companion. Enter the Low Lantern AR0133. Head to the third deck down AR0135 and talk to Yago. Kill him. Collect his book and return to Brielbara in the Splurging Sturgeon in NE Baldur's Gate. Raid the two locked chests. Raid the three locked drawers. Enter the house AR1211. Talk to Ghorak. He needs curing. Head to the Three Old Kegs in N Baldur's Gate. You can return to Ghorak once he has been cured but it is not necessary. Raid two bookcases and the locked chest. Raid two bookcases and the drawers. Enter the locked house AR1209. Larriaz will approach you. She has killed a fisherman's family and is dying. You can leave her to die or kill her. Enter the warehouse AR1208. Talk to Noralee. She will not give you the quest if your NPC Reaction is less than 8. She has lost her gauntlets. Leave the warehouse and search a chest to the SW of the WaterQueen's House. You can either keep the gauntlets or return them to Noralee. Your reward depends on your NPC Reaction. Raid a crate, two barrels, a locked chest and desk. Enter the warehouse AR1207. Kill the Basilisk. Collect the gem from its body to pay G'axir the Seer also in SE Baldur's Gate. Return to Nadarin in SE Baldur's Gate. Raid a crate, three barrels and three locked chests. Enter the locked house AR1213. You can pickpocket Cordyr. Talk to him. He will not give you the sidequest if your reputation is greater than 14. He wants you to kill some Sirines in the Lighthouse area. Agree. You have probably already killed them. Talk to him again. Your reward depends on your reputation. Raid the barrel and shelf. Raid one bookcase and the drawers. Entillis will hail you. If your Reputation is less than 8 he will attack. Kill him. It is worth saving this quest until most of the others are complete. Enter the tower AR0616. Triadore will approach you. You can pay him 300gp to reveal what he knows but it's not really necessary. A Guard will also approach. If your NPC Reaction is 8-20 you can bribe him 100gp to prevent hostilities (also prevents the Merchants turning hostile) or just kill him. Go down to the basement AR0611 via the steps in the SE corner. Kill the Guard. Go to the second floor AR0612. You will be approached by Dra'tan. Tell him the truth and kill him and the other guards. Go to the third floor AR0613. You will be approached by a Guard. If you say you are from Cormyr he will attack. Otherwise so long as you have an NPC Reaction of 15-20 you can use any excuse (except of course Cormyr) and he will leave. Both Nortuary and Emissary Tar are here on business. Be helpful and don't kill them. Go to the fourth floor AR0614. Killing anyone here will result in serious loss of reputation. Destus Gurn will approach you and fill you in on who is upstairs if you play along with his mistaking of your identity. There are two merchants on this floor who, if you say you're looking for the leaders of the Iron Throne and that you're merchants from Cormyr, will summon three Guards who will attack. Before you go upstairs to the fifth floor AR0615 use whatever protective enhancing spells you have at hand. There is a large battle waiting up there. Try splitting your forces evenly to both staircases that go up to the fifth floor. Kill everyone: the false Emissary Tar, Aasim, Alai, Diyab, Naaman, Zhalimar Cloudwulfe and Gardush. Talk to Thaldorn and pressure him for information on the rest of the Iron Throne. You can refuse to let him go and kill him. Search the desk for two letters. Return to Duke Eltan in SW Baldur's Gate. As you leave the tower Caedmon will approach you and direct you to Eltan. Enter the WaterQueen's House AR0609. If you have not been here before a Priestess will approach you. You can ask for Tenya, if you talked to her at Wyrm's Crossing, and demand Casson's body. However if you didn't complete her previous quest (by either returning the bowl or killing the fishermen) and your NPC Reaction is 1-14 she will attack. The other priestesses will not come to her aid if you fight her. If you never met Tenya ask to speak to Jalantha Mistmyr (which will cost you 50gp). She will demand a high price for the return of the body. If you did not help Tenya then consider killing Jalantha in the Lothander and Marek sidequest. Return to Varci in W Baldur's Gate. Preferably you should have already completed the sidequest for Varci in W Baldur's Gate. Enter the Water-Queen's House AR0609. If Jalantha is not already here find the Priestess who can give you an audience with her. You will have to pay for the privilege. Talk to Jalantha and ask her help to remove Lothander's geas. She wants you to retrieve a book from the Temple of Tymora. Head to the Lady's House in West Baldur's Gate. Return once you have the Tome of Understanding. Tell Jalantha you must have the scroll before you will give her the book. When she asks for the book you can say you don't have it. She will attack. Kill her and then her Priestesses. 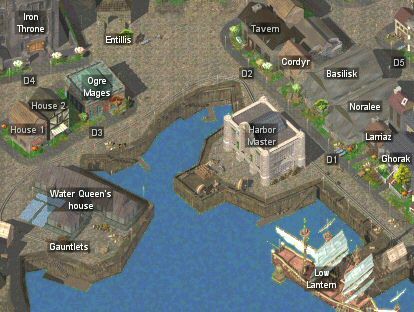 Head to the Blade and Stars in SE Baldur's Gate. Raid the bedside table and chest. Raid two bedside tables and the drawers. Enter the building AR1201. You will be attacked by five Ogre Mages. Kill them. Raid two bookcases and two display tables.